Flea bites and mosquito bites are both the result of bloodsucking pests. Still, they have some differences. In this article, you will discover how to tell the difference between the two. I will also detail how to treat flea and mosquito bites. Most importantly, you will learn to identify the signs of a potentially serious allergic reaction. What Do Mosquito Bites Look Like? Not every person will react to a mosquito bite the same way. Some people are more sensitive to the bites of these insects than others. The most common reaction is an itchy, red bump. This can appear within moments or hours after the mosquito has bitten you. The average mosquito bite will be irritating for a few days at the most. After this period, it will disappear on its own. Although, an allergy to mosquito bites can result in a more extreme reaction. You may experience welts, hives, or blisters. Welts due to mosquito bites can vary in size. Usually, they appear as an exaggerated mosquito bite. The skin surrounding the bite will swell and redden. The welts may feel sore to the touch. Hives and blisters can be painful as well as unsightly. They are evidence of an allergy to the bites. These lesions can appear on the bite itself or in the surrounding area. Severe allergies to mosquito bites are rare, although they do happen. These include hypersensitivity to mosquito bites (HMB) and skeeter syndrome. HMB results in an intense reaction that appears shortly after getting bitten. This disorder causes rapid, acute swelling. Blisters filled with fluid can erupt on or around the bite. Other symptoms, such as a high fever, may occur. HMB can even cause kidney failure if it is not treated. 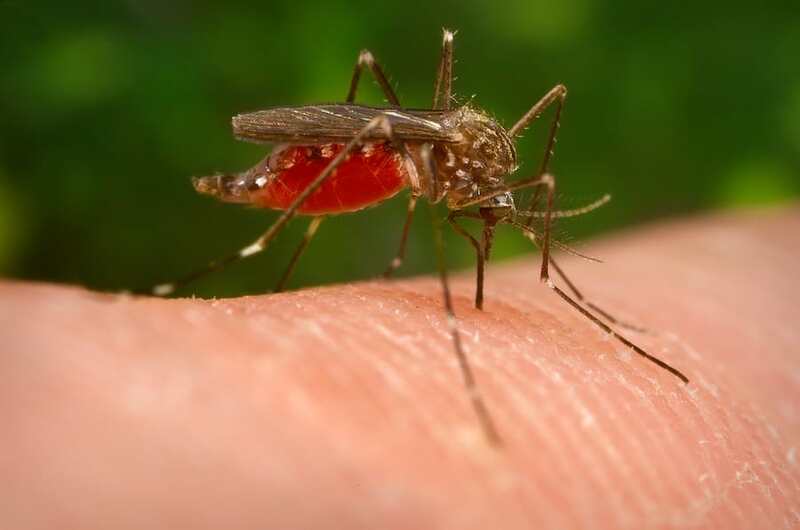 Skeeter Syndrome causes your body to respond to mosquito bites as it would to an infection. The bite grows red, swollen, and feels warm to the touch. Depending on the severity of your allergy, your skin may blister. As with HMB, skeeter syndrome can cause internal symptoms. These may include a high fever and nausea. The most serious type of reaction you can have from a mosquito bite is anaphylaxis. This is a body-wide response to an allergen. Aside from a visible reaction at the bite location, you can go into shock. Anaphylaxis can make it hard for you to breathe and requires immediate medical attention. Mosquito bites are not venomous in the same way as a wasp sting. Still, the itching alone can be unpleasant. Hives, blisters, and swelling can cause discomfort. If your bite begins to swell, apply a cool washcloth or an ice pack. If you have blisters, be careful not to burst them. You should also wash your bite with water and disinfectant soap. Mosquito saliva is the substance that causes the symptoms, not the bite itself. Cleaning the bite will wash away residual traces of saliva. Purchase antihistamines from the pharmacy to combat itching and swelling. You can choose from topical products (e.g. gels) or tablets. Your pharmacist can recommend a suitable antihistamine for your type of reaction. If the bites are painful, take non-prescription painkillers or anti-inflammatory drugs. If your child has been bitten, make sure medications are child safe. Do not scratch or pick at your bites. Leave blisters to pop on their own. You do not want to end up with a secondary infection. If you suspect you are going into anaphylactic shock after a bite, seek medical attention immediately. If your mosquito bite does not get better after several days, consult a doctor. You might have developed an infection. Mosquitoes can transmit a range of diseases. If you live in a region with disease-carrying mosquitoes, monitor yourself for any unusual symptoms after a mosquito bite. These can include joint pain, fever, or an upset stomach. Flea bites typically appear in groups of three. As with mosquito bites, they are usually small, red bumps. This hallmark pattern is known as ‘breakfast, lunch, and dinner’. These bites are intensely itchy. Each bite can range in color from light to dark red, depending on the person. They are circular in shape. Unlike mosquitoes, fleas prefer to stay on their hosts longer. This is why they usually bite several times in close configuration, rather than once. If you have a sensitivity to flea bites, additional symptoms can manifest. Your flea bites may start to blister. In some individuals, the bites will begin to resemble small wounds. Being repeatedly bitten by fleas can worsen your reaction. The skin around the flea bites can turn red or swell. You might also develop a rash or blisters near the bites. An inflammatory response, known as papular urticaria, can result from repeated flea bites. This condition is chronic, and usually affects children. Papular urticaria causes hives that can manifest anywhere on the body. These hives may ooze fluid and are always itchy. The reaction recurs in cycles, sometimes long after the flea bites have healed. They will usually subside and reappear every few days, for up to a month. In some cases, the throat may swell, inducing respiratory distress. It is important to treat a flea bite as soon as you notice it. Treatment can alleviate the severe itching of the bite. You also want to avoid scratching flea bites for several reasons. As with the majority of insect bites, a flea bite is a form of an open wound. The flea must puncture your skin in order to feed on your blood. Scratching can bring bacteria into the bite and lead to infection. The first thing you should do, therefore, is clean your bites with soap and water. Puncturing any blisters you may have can increase your risk of infection. Take care not to do so while cleaning the bite and the skin around it. Secondary infection from flea bites is common, especially in children. Keep your child’s nails short and discourage scratching. Keep in mind that fleas defecate while they are taking their blood meals. This is why it is essential to thoroughly wash the affected area. As with a mosquito bite, it is the flea saliva that produces the reaction. Flushing the bite with water can remove traces of saliva. To relieve itching and swelling, use antihistamine medication. Your pharmacist will advise you what type and form of antihistamine to take. Calamine lotion can also alleviate itchy bites. If your bites remain inflamed, an anesthetic gel may help. Apply antibacterial solutions to your bites if they have blistered and burst. Monitor your flea bite for signs of an infection. If your bite begins to ooze pus or turns crusty, check with your doctor. Certain species of fleas carry tapeworm, a type of parasite. You can consult your doctor for a precautionary treatment just in case. Fleas can also transmit disease through their bites. If you experience a high fever or other concerning symptoms after getting bitten, seek medical attention. It is better to avoid the bites of these bloodsucking insects entirely. Use insect repellent while you are outdoors. Ensure that your companion animals are treated regularly for fleas. Now you know how to identify flea bites and mosquito bites. If you suspect you have an infestation of fleas or mosquitoes on your property, take action.